In 1986, around 750 000 people reported having a hearing problem, according to the Galludet Encyclopaedia of Deaf People and Deafness. This is around 5% of the population, and that figure has most likely increased in the twenty years since this information was reported. Even if you don't know someone with a hearing difficulty, fluency in sign language is a useful skill to posess. Auslan is the language for the deaf community in Australia. It is related to British Sign Language but, much like the spoken languages, the grammar and vocabulary are distinctly Australian. Linguists also recognise two different dialects, Northern (Queensland and New South Wales) and Southern (Victoria, Tasmania and South and Western Australia), with regional vocabulary differences. Auslan differs quite dramatically from American Sign Language (ASL); one of the biggest differences is that Auslan requires two hands while ASL only requires one. Important to the language is the manual alphabet, known as finger spelling. 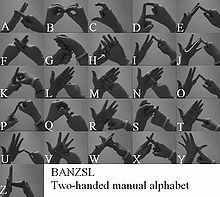 One can communicate with the deaf solely by using the manual alphabet, although it can be timely. Signs for words have been borrowed from English, Irish, Scottish and even American Sign Languages. Deaf Australia Inc organises Auslan community classes in locations around Australia. Beginners can start with Introduction to Auslan, while Auslan 1 is geared towards those who already have some knowledge of the language. Classes are $125 for adults and $110 for concession holders. You can find out the location of a class near you here. The Auslan website also provides a signing dictionary and instructional videos and manuals, which provide a good introduction to the language and can be used as a practice aid alongside lessons. Auslan is a relatively easy language to learn and can be a lot of fun to use!